This Bitspower connector serves as a connector between two Wakü components, each with a G1 / 4-inch male thread. The connection is particularly protected against leaks thanks to its rubber seals on each side. The white finish also looks very classy and will leave a lasting impression on every viewer. 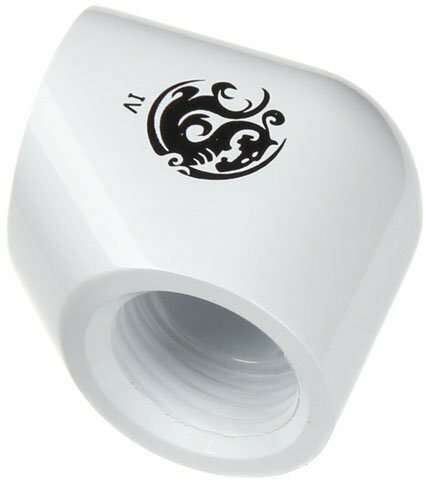 What is the purpose of an angle connection with two G1 / 4-inch female threads? This is a white, double G1 / 4-inch connector designed to easily and quickly connect two Wakü components with G1 / 4-inch male threads. The adapter has an angle of 90 degrees and is therefore particularly well suited to redirect Wakü tubes in a different direction, without having to edit them manually. For maximum tightness provide two additional rubber seals.